I received some questions from people asking whether it is possible to install Logframer 1.2 on a Windows computer. As I designed Logframer with people in developing countries in mind, and because research shows that more than 30% of computers in most developing countries still use Windows XP, version 1.2 is still fully compatible with Windows XP. Make sure that Windows XP Service Pack 3 (SP3) is installed. Without this Service Pack, Logframer won't run. 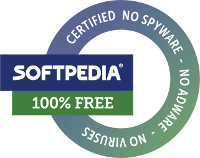 You can use Windows Update or download the service pack using this link that takes you to the site of Microsoft. Both these updates are free of charge. The requirement to install Visual Basic powerpacks has now been removed. So if you had this problem, please try to download and install Logframer 1.2 again. This time you won't see this warning. Here it is, the latest version of Logframer. I imagine one day people will cue for the latest Logframer version like they do for the newest Apple product now. Then again, I do have a large imagination. The most obvious change in this version is the new print and print preview window, as well as the updated reports. I've also added a new report: the resources table. It gives an overview of the necessary resources and their cost for each activity, which is not the same as the project's budget because some resources may be shared between activities. The function to import logical frameworks made in MS Excel also received an update, ironing out some bugs in the previous versions of Logframer. And finally there is another smaller addition in the form of a search option for contacts and organisations (as well as their addresses and so on). Under the hood major changes were made to improve Logframer's performance. You can now tweak the speed of the interface yourself, by making a choice between faster rendering or more accurate rendering. And finally a series of smaller quirks and bugs were ironed out. So quickly head for the download page and install Logframer 1.2 now! Read more about Logframer 1.2 out now! It's been a while since the last update, but that doesn't mean nothing happened. On the contrary, Logframer version 1.2 took quite some work. Major changes were made 'under the hood', in an effort to improve Logframer's overall performance. You may have noticed that the interface slows down when you make large logical frameworks. The reason for this is the possibility to use rich text (individual words and letters in different fonts, sizes and colours; put text in bold, italics etc.) So the rendering engine got a major overhaul. In version 1.2, you will be able to choose whether you want faster rendering (at lower quality) or higher quality rendering (at lower speed). The faster rendering option is especially interesting if you have an older and slower computer. At the same time, every individual report got a major overhaul to remove any bugs (and add new ones - just kidding) and also to improve their rendering speed. Finally, a new report was added: the list of resources. Although Logframer doesn't (yet) allow you to create a seperate project budget, you can specify for each activity which resources you will need and indicate how much those resources will cost. In the previous versions, there was no way of printing the detailed calculations that you can make. So this new report gives you a detailed overview of the costs linked to every activity. A final addition is that you can search your contacts and partner organisations. The current search function allows you to search the logical framework and all related details (target groups, risks, etc.) but not the contacts. In version 1.2 you will be able to search all information. So there you have it, a quick update. I hope to be able to release version 1.2 in a couple of weeks time. So stay tuned! I recently received a mail from someone at IFRC who was testing out Logframer and who came across a problem while trying to import a logical framework made in MS Excel. 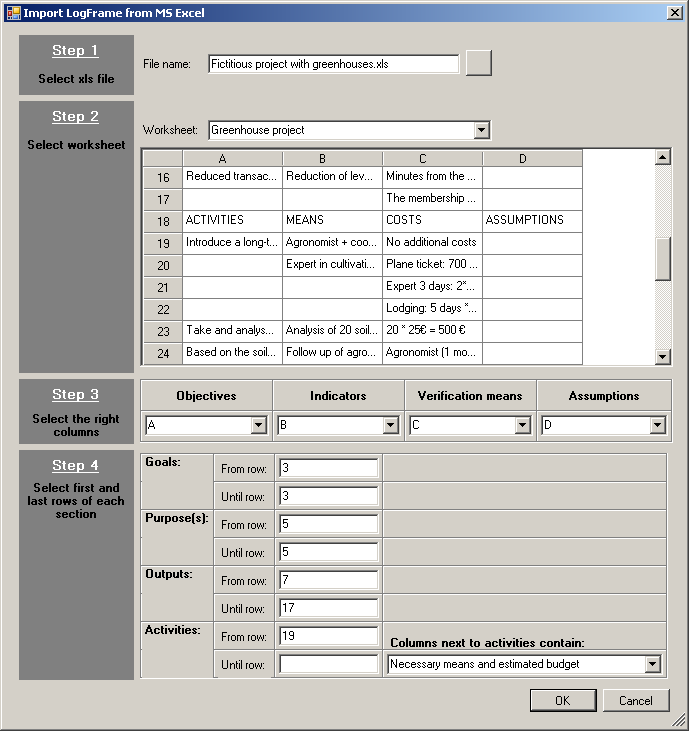 It occured when he selected the file to import (step 1), after which he got an overview of the information on the first worksheet within the Excel workbook (step 2). At that point, he pressed < OK > and got an error. Step 1: Select the Excel file that you want to import by clicking on the button with the folder icon. 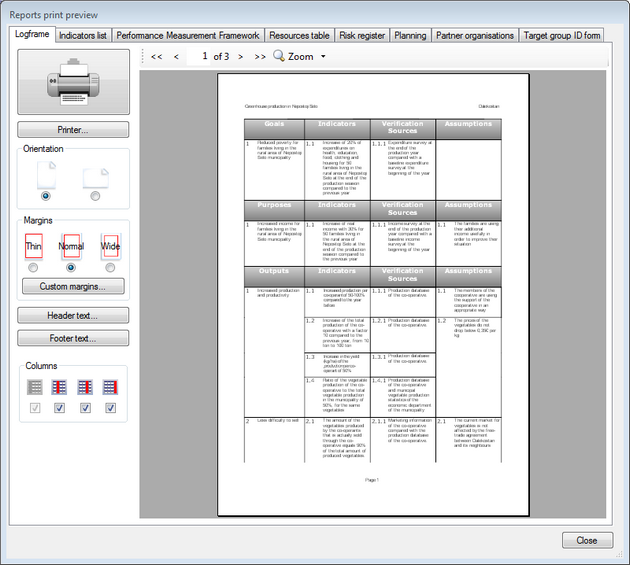 Click on the downward arrow of the worksheet selection box (above the preview). Now Step 3 will appear. 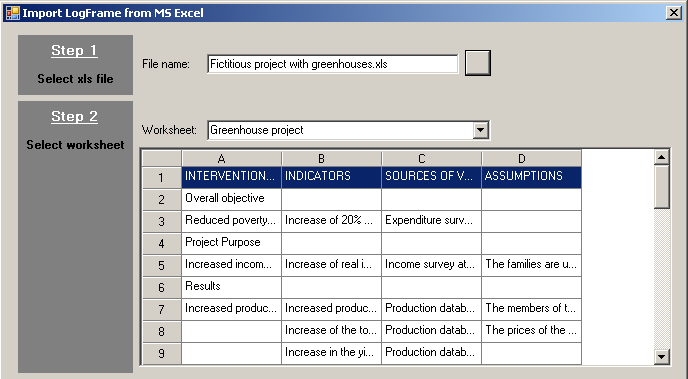 Step 4: indicate that first and the last row number of each of the following sections: Goals, Purposes, Outputs and Activities. When you import a logframe from Excel, Logframer will put all the outputs (results) under the first purpose (specific objective) and all the activities under the first output (result). This is because it's difficult to capture how you ordered your activities, outputs, purposes and goals in your Excel file. So after importing, you will need to move things around a bit. This is very easy: drag with your left mouse button to select the items you want to move, then drag them with your right mouse button to the location you want them to be. For more information on this procedure, visit this Logframer help page. Thank you for this wonderful tool , perfectly suited for collaborative work. This word proved to be the key for Epiceries (www.epiceries.org) with this version of Logframer. I 'm on a Mac, and there is no Mac version , so it is the field teams in Congo and Niger, which use PCs, who tried it first. We discuss things on Bistri; I bring my insights on the approach, they give feedback, send me the pdf, we revise the whole thing... It works very well. I won't have a PC available as a backup before the teams will have mastered the approach. I hated the logical framework approach and project cycles because you had to design them in software that wasn't suited for the job . We worked on large paper sheets versions, which were impossible to send to other people. My goal is not to satisfy donors but provide good tools for teams that help to look at information under different angles. Phew phew phew! So thank you very much for having presented us with this tool. What I particularly like about this testimony is how these teams collaborate and share using the different features of Logframer and other software. I hope to improve the possibilities for exchange and group work in future versions of Logframer. Merci pour ce merveilleux outil, tout à fait adapté pour le travail collaboratif. Ce mot prend tout son sens à Epiceries (www.epiceries.org) avec cette version de Logframer, car je suis sur Mac, il n'y a pas de version Mac, et donc ce sont les équipes terrains au Congo et au Niger, qui sont sur PC, qui se lancent. On discute sur Bistri, j'apporte mes lumières sur l'approche, ils avancent, m'envoient les pdf, on les revoie ensemble, ça marche très bien. Je n'aurais un pc de secours pour ce logiciel que quand les équipes maitriseront l'approche. Je détestais l'approche par cadre logique et les cycles de projets à cause de la mise en oeuvre dans des logiciels qui n'étaient pas faits pour. On travaillait sur des versions grandes feuilles papier, intransmettables à d'autres, mon objectif premier n'étant pas de satisfaire les bailleurs mais de donner de bons outils aux équipes, qui permettent d'aborder les données sous des angles différents. Ouf ouf ouf! Merci donc de tout coeur pour nous avoir présenté cet outil. Ce que j'aime particulièrement dans ce témoignage, c'est comment ces différentes équipes collaborent et s'échangent entre eux, en utilisant les différents possibilités de Logframer ainsi que d'autres logiciels. J'espère pouvoir améliorer les possibilités d'échange et de travail en groupe dans une des prochaines versions de Logframer. Anyway, I am very pleased with the growing attention that Logframer is getting. I've received hundreds of messages over the last months with thank yous, congratulations and some suggestions for improvements. I do try to incorporate your suggestions in the next version (or a later version) of the software, or in the website. The site itself has seen close to 8000 visitors in half a year's time, which is an excellent result as far as I'm concerned. So overall, feed-back has been great and a big encouragement for me. Thank you for using Logframer and I hope you will keep spreading the word to your colleagues and contacts. You may have noticed that it's been difficult to get access to this website the last couple of days. The website was down for several hours a day. As luck would have it, I was away on a mission to Tanzania, and unfortunately I couldn't get access myself because the spam filters thought I was a bad guy. After exchanging with my ISP, it seemed to improve a bit and I thought things were back to normal. But they weren't, unfortunately. It was only after my return to Belgium that I discovered the real cause. The site was the victim of an orchestrated campaign to fill it with spam messages. Various different sources were trying to post heaps of 'interesting' messages about brand clothing, scantily clad women and unreliable links. Fortunately, all messages have to get my approval. Unfortunately, the site was very quickly running out of disk space. In the space of only a couple of days, tens of thousands of these spam messages were blocking the site more and more. Fortunately, I was able to delete them all at once. However, if you posted a question during the last couple of days, I may have inadvertently deleted it so you may have to repost it. I also had to increase security, which at the same time means that it's become a bit more difficult to post a comment. You will notice a so-called Captcha image, with a code that is only human readable (I hope...) and that you have to confirm before you can post your message. After that, I still have to approve your comment. Anyway, the site has resumed normal service and I'm very sorry for any inconvenience that you may have experienced. Ok, I admit: it took me a wee bit longer than 'the end of summer' to roll out version 1.1, but that doesn't matter now because it's finally ready! And I just now you are all as excited as I am! A bilingual interface, meaning that you can select between a French or an English user interface. Other languages will follow, with Spanish high on the agenda for a next version. A powerful find and replace tool: as mentioned earlier on this blog this was a request of one of the users that I picked up. Now you can search your logframe and the various windows with detailed information for specific words and replace them if you want. The recent files list that I mentioned here before. This thing really came in handy when I tested this new version. Apart from these new features, I also did a lot of work to improve the stability of the application. Sometimes, the undo/redo mechanism caused the whole application to come to a screeching halt. There were some stability issues with certain details windows too. I hope they are now all ironed out, but please inform me should you come across any more problems. Read more about Logframer 1.1 Out Now! A couple of weeks ago, I got a comment from someone who was really pleased with Logframer, but who thought that one thing was missing: a search tool. 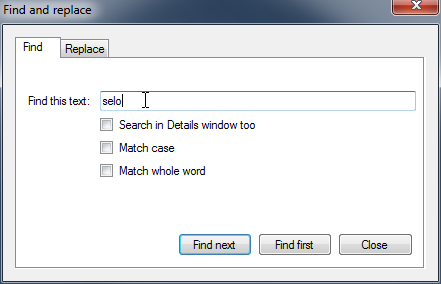 As you can see, Logframer 1.1 will both have a find and a find-and-replace function. You will have the option to search in the logical framework itself, or both in the logframe and any of the details windows.